Time to add market exposure on volatility? Editor’s Note: Tony Dwyer, U.S. portfolio strategist for Canaccord Genuity, and his colleagues author a widely respected monthly overview of market conditions, technical factors, and future market outlook called the “Strategy Picture Book.” The following provides an excerpt from their July 11, 2018, report on the macro market outlook. Earlier in the year, we were much more nervous about a meaningful correction because sentiment was at an optimistic extreme, the CBOE Volatility Index (VIX) was historically low for an extended period without any meaningful drawdowns, and the S&P 500 (SPX) was up 7.5% in the first three weeks of the year. As we enter the second half, the extreme economic and market optimism has been relieved, and, according to Thomson Reuters I/B/E/S estimates, we are about to enter what should prove to be a very solid Q2 2018 EPS reporting season. 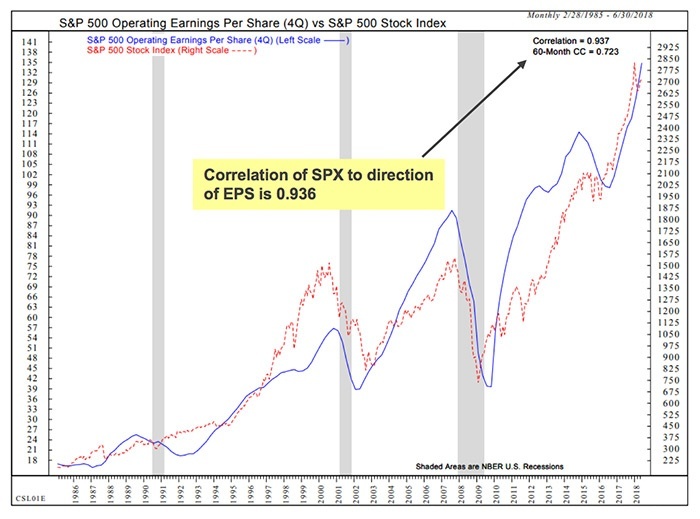 We are not suggesting there won’t be corrections and volatility, but ultimately the SPX correlates with the direction of earnings per share (EPS), which should stay positive through 2019. Q2 2018 EPS growth is estimated to be 20.5%, driven by the more cyclical sectors such as Energy, Materials, Info Tech, and Financials. Clearly, the 2017 tax cut legislation and more business-friendly regulatory backdrop opened the door for accelerated domestic economic growth and the 20%-plus jump in SPX EPS. History shows the current estimate should be too low. Throughout this cycle, EPS estimates have been revised up a median 3.4% from the beginning of reporting season to the last report. This suggests Q2 2018 growth should be over 24% when all is said and done. As a reminder, Q1 2018 consensus going into reporting season was to be up 18.5%, and it ended up rising 26.6%. The equity market is most closely correlated to the direction of earnings. SPX Operating EPS should end the year with over 20% growth. The direction of earnings is driven by economic activity, which remains in an uptrend, and is accelerating. Business and consumer confidence all remain near a historic high. NFIB Small Business confidence hit a cycle high in May, and the median lead from cycle peak to recession is 41 months. Positive economic activity is driven by the positive yield curve and availability of money. Over the past seven cycles, a recession did not begin for a median 19 months after the initial date of inversion of the U.S. Treasury curve. The slope of the yield curve and availability of credit is driven by Fed policy, which is neutral. The real fed funds rate using the Core PCE is roughly at zero, which is well below any other period that drove recession. Our checks and balances in case it might be different this time for credit are the NFCI stress indexes, which show historically low stress. Fed policy is driven by core inflation, which should remain in the range of the past 20 years. 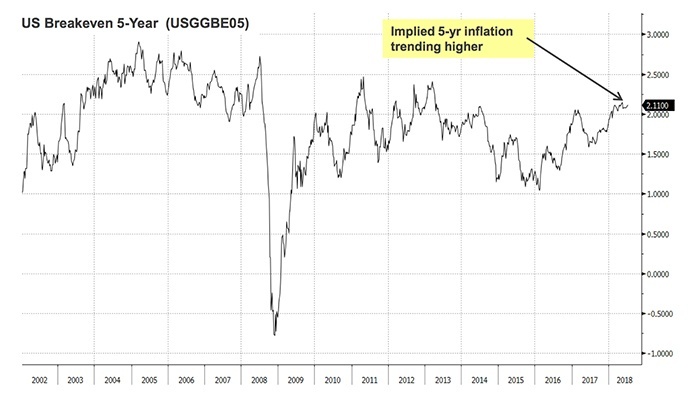 Though the current implied five-year inflation rate is higher, it is still below this and prior cycle peak levels.